WIDOS LLC was started outside of Atlanta GA at the end of 2010 with just 2 people. Eight years later we have grown to 7 people and are located in a new facility with over 20,000sf of space with over $2M USD of stock machines and parts. From our location we cover sales, repairs and service for a large territory: Our partners are located from Mexico to our south and Canada to our north, to the Atlantic and the Pacific Oceans! North America and the U.S. in particular have seen an exponential growth in the application and installation of thermoplastic piping systems in recent years. While this has typically been limited to potable water, sewer and drainage applications (PE piping systems) there is a growing market for piping systems used in the hydronic piping sector (PPR piping systems for heating and cooling water). The WIDOS line of fusion equipment is exactly the type of equipment best suited for these “inside the foundation” piping applications. Rugged and durable, relatively lightweight, modular in design, and boasting the most user friendly operation in the market has helped grow the success of plastic piping systems across a wide range of markets. WIDOS equipment has been involved with several of the newest sports complexes (including the new Mercedes Benz stadium in Atlanta and the US Bank Stadium in Minneapolis), major hospital construction and renovations, high-rise hotel construction, and large pharmaceutical building construction. WIDOS: What are your customers’ main application areas? Jim: Currently we are providing our machines and services to the growing PPR Hydronic and Mechanical Piping systems market. This market is seeing the most growth in the US right now. We are also involved with the water, sewer and drainage markets which are typically installed with PE piping. But we are not limited to these areas alone. WIDOS LLC has partners that are heavily involved in a wide range of plastic piping applications, including water treatment facilities, chemical production plants, steel producers, pharmaceutical facilities and the semi-conductor industry. WIDOS: What are your customers’ service expectations concerning machine rental, maintenance and repair? Jim: In North America customers’ demand cover 3 main areas: availability, service, and innovation. Concerning availability, the market does not wait for delivery of machines. Projects are “fast tracked” and tooling must be available to fill the contractors’ needs. Our service must ensure that contractors get quick reaction to their on-site needs. Everything from answers on machine capabilities, specifications, machine operation training, or spare part numbers/pricing/availability. Regarding innovations, customers want to see that WIDOS is reacting to the installers’ needs in terms of the best installation practices, meeting or exceeding the latest standards and codes for installation, and continually applying the latest technology for improving machine performance and installer production. 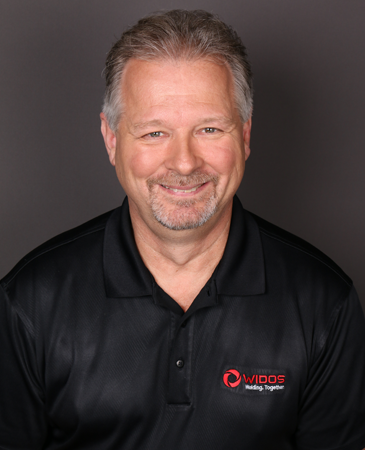 Jim: WIDOS LLC is focused on outperforming the competition and meeting the customers’ needs in all 3 phases of customer expectations. We take aggressive measures to read the markets, noting what machines will be required by contractors, and make sure we have stock available. We have established quick reaction practices to be available to return inquiries and provide answers quickly to contractors on site. We also focus on fast turnaround for machine repairs and servicing, so we keep customer “down-time” to a minimum. And last but not least, we listen to the installers and project managers to stay on top of what is needed to assure successful installations with WIDOS machines. Listening to our customers, and meeting their demands, is critical to our continued growth and success in North America.